One of the first things anyone notices about a building is its state of cleanliness. No matter what style your building represents, it will not make a good impression on anyone if it is covered in dirt and sludge. But there are some limits you cannot simply reach by yourself, like tall buildings with hard to reach corners that remain the most unattractive. It’s a high time to change the way your space look on the outside and make that positive feeling on everybody that is looking at it or passes the threshold. In the end, you want to match the aesthetic of the inside to the outside, to make people feel welcomed. That’s why you need a reliable company that can keep your building clean and attractive on the regular. Our specialists can handle cleaning buildings of any height, thanks to CSCS certificate and dedicated trainings. 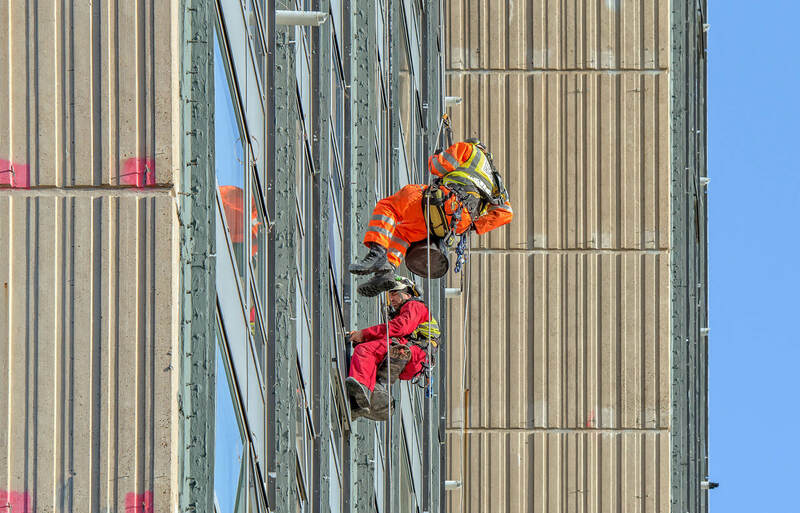 Those hard to reach places, be they simple walls or windows, or any other element of a building, is nothing to our technicians who, equipped with only a rope and a bunch of tools, can deftly handle their job at great heights. Rope access is the most efficient way to clean buildings, being not only quick and much cheaper than scaffoldings but also the safest option available. With R.A.I.L., you get the best rope access service available in the entire city. With us, you are guaranteed to enjoy the super-effective cleaning assistance combined with ultra-friendly customer service.